'Handyman', the predecessor album, was highly praised by critics, and fans alike. 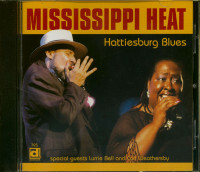 Regarded one of the best blues releases of 1999, it opened many doors for the band. 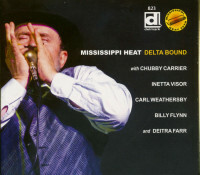 With their new CrossCut production Mississippi Heat will win many, many new fans with their innovative interpretation of modern Chicago style blues. Bandleader is Pierre Lacocque. He's not only one of the leading exponents of innovative harmonica playing in the US today; he's also a talented and accomplished blues song writer. Along with managing brother Michel, he has discovered a new vocal talent: singer Inetta Visor, one of the best black voices I have heard in a long time. The band sounds tighter than on their last album. And the concept hasn't been changed. Carl Weathersby's guesting throughout, delivering some of the finest rhythm guitar you might expect. He's also soloing on three cuts, as well as handling the vocal parts. Also on board is vetetran singer Billy Boy Arnold. New on the guest list: 'Madcat' Ruth, one of the most powerful harp players I've ever heard. He's duelling with Pierre on 'Madcat Hop'. 'Footprints On The Ceiling' is powerful and deep, emotional and heartfelt Chicago style blues for the 21st century. We love it. I know you will too! For track details and musicians, please see 'CrossCut - The Label'. 04 What Kind Of Man Is That? 13 What Else Can I Do? I was happy to hear from Pierre when he called to ask if I'd write liner notes for Mississippi Heat WARNING SHOT, the bands 11th release. There was urgency and excitement in the voice of this harmonica-playing band-leader: "I'm s0000 excited about this album!" Normally Pierre is pretty even keeled with me, so his exuberance was a little out of character, and I couldn't wait to hear the album. My first encounter with Pierre was a spring 2005 phone interview, where he went to great lengths to tout contributions the entire band had made on their then current CD, ONE EYE OPEN (Delmark 783), and was very open about his personal life, sharing with me the chaos and loneliness he experienced as a child. Pierre explains that his melancho-lia may have come from some genetic pre-disposition. but it also came from an austere Calvinist environment that shunned joy and individual expression. Music, sports (soccer in particular as he lived across the street from a famous soccer stadium in Brussels) were all discouraged. On the paternal side, two generations of ministers offered both serious thought and severe restriction; and on the maternal side, the arrest of his uncle Jean during WWII (who died in a concentration camp) and Pierre's grandfather (tortured by the Nazis for Resistance activities) caused a life-long period of unending mourning. There were other contributing factors to the feeling of detached loneliness, including being born a Christian in Israel, being for 12 years the only Christians with his brother and sister) in an orthodox Jewish school in Brussels, and living in 4 countries before age 5! He documents those lonely feelings on "Too Sad to Wipe My Tears". It wasn't "growing up black" in 1920s Mississippi, but the blues had found Pierre at a young age, and he wrestled with how to deal with them until age 16 when his family moved from Belgium to Chicago, and he happened upon the now legendary Big Walter Horton blowing harmon-ica at a performance near Pierre's University of Chicago neighborhood home. It was a lightning-bolt moment, and within days he was tearing into "the blues" with his newly purchased harmonica. Lacocque continued his harmonica playing while attending college in Montreal (1970-1976), but stopped after a few years when he mentally hit rock bottom. This was after he had won the Montreal Battle of the Bands with a quartet named "Oven." He says stopping hod no real connection with that award, or with the sponsor reneging on paying the band S1,000.00 toward a record deal. He said he knew he couldn't continue emotionally, that he needed to put words to his non-verbal experiences of alienation. It was then he made a clear and formal decision to study existentialism, Jewish and Christian Theology; and made psychology his career path. He was especially drawn to Jewish theologian-philosopher Martin Buber and to Albert Schweitzer, whose writings were instrumental in Lacocque making sense of his life, and with affirming his family's values he says "I always knew were right," including equality, being considerate of others, and the mystery and beauty in connecting with people. 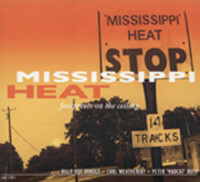 Longtime Mississippi Heat drummer Kenny Smith says those values are apparent to the members of the band, adding: "He is one of the most genuine guys I know. He takes the time to understand you as a hu-man being and cares about EVERY musician on AND off the bandstand. When we travel, he looks out for all of our needs. If the hotel isn't right, or the food isn't right, he takes care of it. 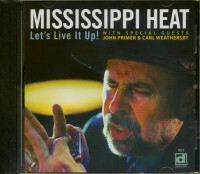 Smith, one of the most in-demand drummers in blues and Mississippi Heat's drummer since early 1997, adds "Pierre is very sincere; he expresses his emotions through his music. You see it in the glare in his eyes when he plays. For me, I con 'feel' him and his passion when we're on the bandstand. He brings that chemistry every night, and that has a domino effect for the other musi-cians. That's what every musician wants, and when you feel that vibe you can't help but soak it up." Another band member he calls a dear friend, lead vocalist !nett° Visor with MH since 2001) amplifies Smith's praise for Pierre's caring nature, saying "The very first time I went overseas with the band, (guitarist) Carl Weathersby was on the gig, and got very ill, almost near death. Pierre stayed with him the whole time, got his wheelchair, got the ambulance and stayed at the hospital almost 'til show time. Then went back after the show and stayed a week until Carl got out of the hospital. And that's just one example." Lacocque was clearly touched when I read his bandmates' praise back to him, and he was quick to return praise about Visor, Smith, M. Dotson and the rest of the band. 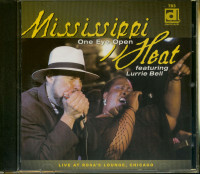 Though this is Pierre's band, and he is the principal songwriter and stage front with his harmonica, there is on ensemble feel to all of Mississippi Heat albums. It shows again here in this stunning CD. The horn arrangements by Sax Gordon give the bond a fresh sound. The ensemble feel comes through in Visor's beautiful and heartfelt delivery. It comes through the fingers of guitarists Michael Dot-son (who also sings on 3 of his songs) and Giles Corey, who masterfully blend in and contribute harmonious rhythm parts and fiery solos. You hear it in the superb rhythm section featuring Brian Quinn on stand-up and electric bass, drummers Smith and Andrew "The Blaze" Thomas. It comes through the sweet and understated playing of young pianist Neal O'Hara, who sounds like a seasoned pro, and from returning guest Ruben Alvarez (3rd album with the Heat), whose percussion and Latin drumming add spice to 3 songs. As for Lacocque himself, I can listen to his playing for hours, which I can't say for most blues harmonica players. Yes he can "blow his brains out' with the best of them, but it's his softer and more "foreign" sound that catches my ear. It's a distant cry that seems to have floated across the ocean from a strange land, a sound not unlike what you'd hear on a gypsy jazz ballad or a Jobim song. At times his harmonica has the feel of a wise old mon passing on his lifetime of accumulated wisdom. Oc-casionally, you can clearly hear a 5-year-old boy pleading his case to God for the loneliness to end. Customer evaluation for "Footprints On The Ceiling"